A wood floor water damage stressor, as described by Deb. "Godzilla our Christmas tree stand, is sturdy, very heavy, holds a good amount of water, but I'm so worried about the hardwood floor that I laid down a heavy black plastic bag and two towels before placing the stand. Whoever refills the water every day gets a lecture (every time) about being careful of the floor! 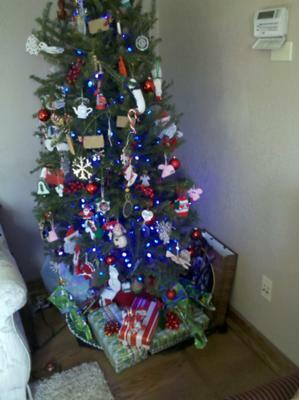 The presents are arranged in a way to prevent inadvertent bumping of the water jug. Babysitting the floor is stressful!" The garbage bags are a good idea, and I understand the towels. It's a hot water heater drip pan big enough to hold Godzilla. A pan with edges, of course, should give you peace of mind. Couple this pan with a Gizmode and Deb, you've delivered your last lecture. Class dismissed, my dear. Be sure to check the homepage on New Years Day for the winner announcement. I am not drawing the winner, but I am rooting for you, and your floating floor.